Motion Control is not a simple Factory Automation, but an ultraprecisionindustry. “Motion Control Show” is a show designed to feature a wide range of motion control and engineering, which are the core technologies in manufacturing facilities and system establishment and operation. Many of South Korea’s consumer electronics enterprises have dominantly exerted their leadership in last month’s CES2012. Amidst the overwhelming presence of Korea’s two local electronics giants, Samsung Electronics and LG Electronics, a small number of Korean small and medium-sized businesses are making the best of promotional opportunities at the show, grabbing more attention than ever. from 300 companies around the world. Organized by Korea Creative Content Agency and Coex, and supported by Ministry of Culture, Sports & Tourism, the Seoul Character, Licensing Fair 2010 will run from July 21 through July 25 at Coex in Seoul. Electronics & Components, organized by Global Sources, will be held from April 12 to 15 at AsiaWorld-Expo, Hong Kong and is scheduled to feature over 2,600 booths from more than 15 countries and regions. 2010 Seoul Living Design Fair, a living interior trend show, will take place at COEX from March 25 through 29. Seoul Living Design Fair is aiming at expanding communication opportunities between industry insiders and ordinary people who are keenly interested in the latest interior trends and developments, as well as creating new business opportunity. 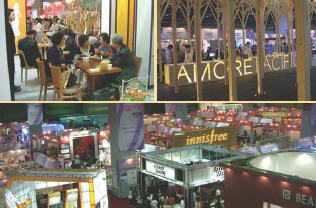 The 2010 edition of the Seoul International Premium & Household Goods Show (SIPREMIUM 2010) will be held at COEX in early March.